It’s hard to admit to yourself when your website isn’t performing. You probably spent lots of time, money and effort to get your website up and the thought of doing the whole process again is very daunting. However, having a good website that attracts customers is so important that the process will be worth it in the end. 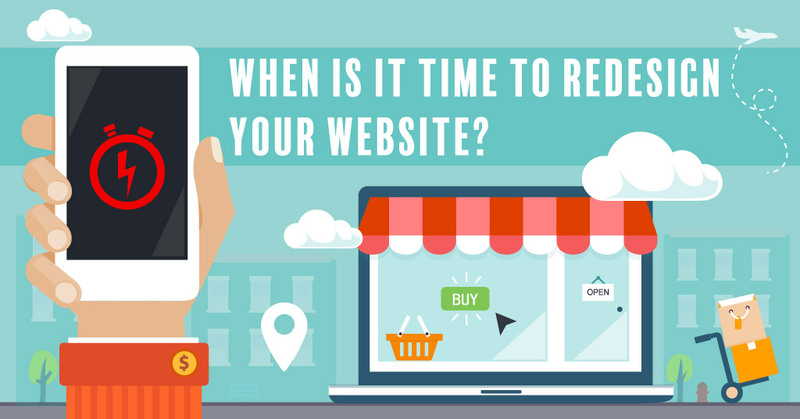 So when is it time to redesign your website? The biggest sign that you need to redesign your website is it is does not look visually appealing. People do judge a book by it’s cover, basically by their first impressions. Your website is your first and most important impression online. So if your website doesn’t even look good to begin with, potential customers will associate your brand as untrustworthy or unprofessional. 1 out of 4 Internet users in the the US are using their mobile devices and it’s clear that having a website that is mobile optimized is very important. Having a responsive website design means that your website was built so that its structure, content and images are optimized for whatever device it’s on, whether it’s a phone, desktop or tablet. It’s especially important considering that 67% of smartphone shoppers will switch to a competitor’s website if their eCommerce check-out process is faster. Customers want everything to be as easy as possible, and a responsive website is necessary for a user-friendly experience. If that wasn’t enough to convince you, your website rankings will suffer if your website is not mobile-friendly. Read more about Google’s mobile first indexing here. Let’s be real, no one scrolls past the first page of Google results. Maybe you’ll go to the second if you’re desperate. Only about 6% of people who perform Google searches end up clicking past the first page of results, and most never make it past the first two or three results. This is why Search Engine Optimization (SEO) is so crucial. Google is constantly updating their algorithm, so if your website is not optimized people will not be able to search and find your business. Contrary to popular belief, SEO is a process that should start from website design if you want to raise your website rankings and drive more traffic to the site. If users don’t like your site, then they won’t use your site. Users who get frustrated will bounce, leave your page, and buy from your competitor instead. The focus of the navigation should be on simplicity and ease of use. Over the course of your business, you’ve probably changed your branding at some point. Whether that be a new logo, tagline, or brand identity all together, these elements should be reflected onto your new website. Redesigning your website is a major task and should not be approached lightly. If you are thinking about doing a website redesign or generating more traffic online, contact our team of Magento certified developers and experienced designers. Our team is capable and excited to help you redesign your website, leave it to the Ready Artwork Team.